A world-class collection of some 250,000 items that visually documents life in America from 1820 to 1920, The John and Carolyn Grossman Collection is now housed in the Winterthur Library. Ephemera—or printed materials usually meant to last only a brief time—include greeting cards, product labels, tickets, calendars, invitations, paper dolls, and much more. The Grossman Collection features the finest examples of these beautiful and intricate pieces of paper that, by all rights, should never have survived this long. Of particular interest are materials that document chromolithography, the first form of commercial color printing. From about 1840 to the 1930s, vibrant colors appeared on a vast array of materials from paper "scrap" used for making scrapbooks to cigar box labels. 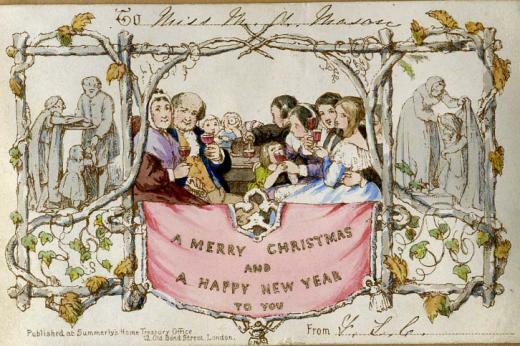 Among the treasures of the collection are the first commercially produced Christmas card, commissioned by English artist, designer, and author Sir Henry Cole in 1843; its accompanying printer’s proof in red ink; and an early American Christmas card from around 1850. In addition, John Grossman saved the archive of the George Schlegel Lithographic Company, a nineteenth and twentieth century New York City business that specialized in cigar box label printing. Winterthur staff looks forward to sharing this extraordinary resource with researchers near and far. This landmark collection is an amazing resource for in-depth study of many facets of American culture. To see an online exhibition of the hand fans in the Grossman Collection, go to the library's exhibitions page. For additional information, see the Grossman's website.